This property was once owned by Ezra Abbott of Andover. Upon his death his estate was sold by John Abbott, administrator and Ezra's widow Hannah Abbott. Asa Farwell of Andover purchased a portion of the estate containing 5 acres 20 rods of land. The deed notes the property on the street leading from Mark Newman's property to the South Meeting House. (School St). It also contains a lane, which may be Abbot St. from Phillips St. The deed also mentions the Boston & Maine Railroad and the lane crossing the tracks. This reference is actually the Andover - Wilmington Railroad line that extended down the south side of Abbot St and crossed over Phillips St. at the intersection of Abbot Street. The train then ran behind the properties on the west side of Abbot St. crossing School St. about where the entrance road to the new St. Augustine's James Doherty Gymnasium is now located. The depot terminus was on Essex St. In 1848 the Boston and Maine purchased the line and then moved the tracks to the current location to service the new city of Lawrence, MA. Asa Farwell paid $1025. for the property and was responsible for the development of parcel lots along this end of Abbot St. In 1852 Farwell hired Mr. Draper to draw a map of the property and designated lots for sale. On Aug. 26, 1857 Farwell, now living in Haverhill, sells lots #10 and #11 to Moses Clement for $535. Clement is a noted carpenter and builder in Andover who later partnered with William Jenkins. Clements deed states "Abbot Street" and gives the following restriction: "Clement must make a fence on the easterly side of the said lot and that no buildings shall be placed on said piece of land which shall be prejudicial to the neighborhood of good dwelling houses." It is not known what year Clement built the home but that he did sell it to Daniel L. Shearer of New Orleans, LA for $4000. on Jan. 1, 1866. The Shearer family owned the property for 49 years. Daniel Lyman Shearer was born Nov. 5, 1819 in Palmer, MA, son of John & Chloe (Baker) Shearer. Daniel and his brothers, Leonard B. and James W. were partners in the furniture business in Boston, connected with the Paine's Furniture Co. His sister Eliza A. was married to John Shearer Paine. Daniel's brother John Harris Shearer b. Sept. 3, 1817 became a Civil Engineer. John H. Shearer married on Oct. 10, 1848 in Ware, MA to Mary L. Hamilton b. Sept. 6, 1818 in Palmer, MA daughter of Joshua & Minerva Hamilton. John was a widower when he married Mary L. The couple had two children: Mary E. V. b. 1851 in Culpepper, C. H. Virginia and Charles H. b. Mar. 11,1852 in Petersburg, VA. John & Mary then moved to Dubuque, Iowa by 1860. John was ill and died of TB in Cambridgeport, MA on Jan. 25, 1862. The Shearer family lived in Cambridgeport. It appears that Daniel L. Shearer purchased the home in Andover for is widowed sister-in-law Mary L. Daniel boards with family at 8 Dana St. in Cambridgeport, but is also found in New York and New Orleans, so may have established furniture stores in these locations. The 1865 State census lists Mary L. and her children in Andover. The 1870 Federal census lists Mary L. Shearer age 50 at Abbot St. Her daughter Mary E.V. is a student at Abbot Academy and Charles H. age 18 is also listed as a student. Four boys; Edward A. King 17 from RI, Leonard A. Henry 16 NY, Horace W. Haskell 17 MA, and William T. Todd 15 New Brunswick board in the home and attend Phillips Academy. Elizabeth Burkley 27 is a servant girl. By 1880 only Mary L. and daughter Mary E.V. reside in the home with one boarding student Daniel H. Wilcox, 18, from GA. Mary E. V. Shearer married on Oct. 17, 1883 at age 32 to Balfour H. Van Vleck. Balfour was a Naturalist and teacher b. 1851 in Fond du Lac, WI, son of J. Dorsey & Louisa (Gurney) Van Vleck. Their marriage lasted just ten years as Mary died on Mar. 18, 1893. Daniel L. Shearer died in April 17, 1902 in Cambridge, MA and was interred in the Shearer family plot in Mt. Auburn Cemetery. His estate was administered James L. Paine. Mary L. Shearer died in Andover on October 3, 1904 and was interred at Spring Grove Cemetery. A life lease was deeded to Charles H. Shearer on October 13, 1905. Charles H. had joined the family business in Boston and lived in both Andover and Cambridge, MA. Charles married Elva T. but had no issue. The Shearer family later sold the property to the Trustees of Abbot Academy on August 18, 1915 and Charles released his life tenancy deed to the Academy that October. Charles & Elva T. later moved to Healing Springs, Alabama where Charles died on July 31, 1930 and Elva on Mar. 24, 1933. This home then opened as a dormitory with Miss Gertrude Sherman, a French teacher at the Academy, and her beloved mother as resident house mother and manager. The former home then became known as "Sherman Cottage". Robert A. Domingue's book "Phillips Academy, Andover, Massachusetts, 1990 notes the following on Sherman Cottage pg. 189. " This building was the locale for escapades such as co-ed roof parties as related in letters hidden by students in a hand carved space under the floor boards, This cache was reported to have taken three hours to create in the 1950-51 time frame." 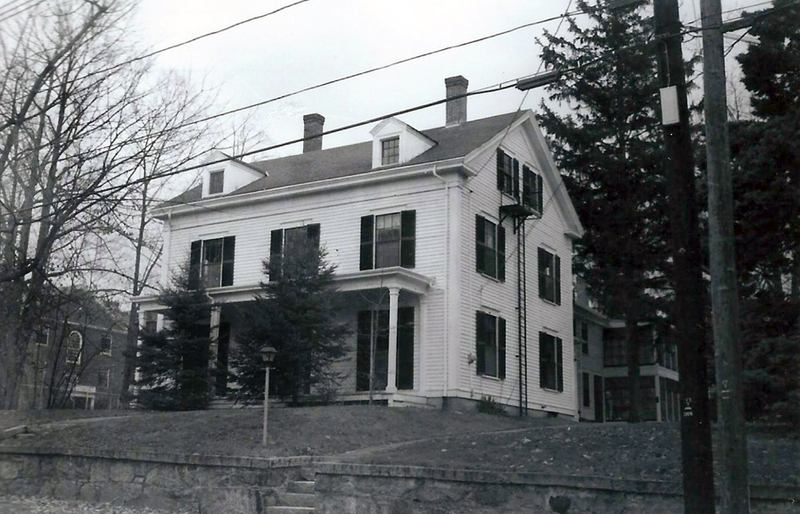 Sherman Cottage was closed as a dormitory house in 1977 and restored as a faculty home in 1979. Ezra Abbott estate, John Abbott Extr.